My buddy Sam Root has a great set of photos and a quick review of the new Beavertail Vengeance flats skiff at his website Salty Shores. I'm a huge fan of this boat having spent a week of permit fishing on one in Key West last April. If you've never seen his work before, you really need to check out Sam Root's photography and videos. 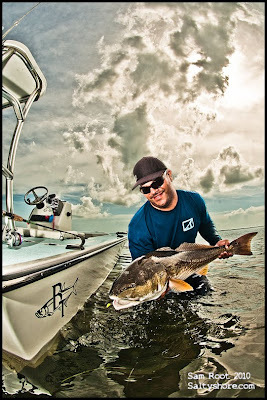 Sam is hands down the best fishing photographer on the water and his stuff always amazes me. Every time I see something new from him I'm inspired to run out and drop a mortgage payment on a new Nikon. Yesterday I got a couple of questions about finding tarpon in this area next month. The good news is that tarpon season in Pine Island extends well into the early fall. I actually consider July to be the best time of year for tarpon, especially the smaller fish that respond so well to flies. The photo above was taken on July 18th of last year. This was a Charlotte Harbor fish that my dad landed in six feet of water using a live threadfin. I caught an identical one twenty minutes earlier on a 1/0 rabbit fur fly. We caught these tarpon on a dead calm morning when there wasn't a hint of breeze and the water temps were well into the mid-80's. Those are perfect sightcasting conditions when the tarpon are forced to roll on the surface every few minutes. The reader also asked me about how to find them during choppy conditions like we're experiencing right now after sunrise. This is a bit more difficult. Around Matlacha Pass I've noticed that once the breeze comes up the tarpon go down. That doesn't mean they disappear completely, it just means you have to head to some cleaner water away from the mangroves if you want to sight cast to them. Pine Island Sound, closer to Captiva and the Gulf, is where you can find these Keys-like conditions. If you want to stay in darker water try chumming just with whitebait just like you do for snook. A white jerk bait, like a Gulp or Exude, has worked well for me in the chop. My 3 1/2 year old nephew Matt landed this trophy pinfish on his first ever saltwater fishing trip last week. I took Matt and his dad to one of my highly classified pinfish spots deep in the backcountry waters of Matlacha Pass where the pins regularly grow to this size and larger. We were using 20# Power Pro line and a live shrimp as bait on a #8 Mustad hook, a little undergunned for this species but Matt landed the 1/4 pound pinfish completely on his own after an epic 30 second battle. Matt didn't have much to say after the fight and immediately went back to playing with the shrimp in the livewell. A future IGFA Hall of Fame member is born. My buddy Paul Murray sent me this photo yesterday of one of the prizewinning snook he's caught on the flats near Stuart, Florida. This part of the east coast is famous for huge snook and produces some of the biggest in the state. Stuart was also hit hard by last winter's freeze, just like we were here on Pine Island, but despite all the doom and gloom predictions their snook population is doing just fine. Can't wait to head over there and land one of these for myself. As you can see by the name on the platform in the background, Paul runs a skiff built by Release Boats called the Classic 15. This is a cool little skiff that uses the lap strake construction method that isn't seen very much anymore. Fans of the classic Willy Roberts or Hewes series of boats, before they were bought and redesigned by Maverick, will recognize this style. I've seen one of these Release 15's in person and they're real head turners. My brother Randy and his family are in town for a visit from PA and yesterday he finally landed his first Matlacha tarpon. It wasn't a huge fish, just a decent fifteen pounder, but it gave us plenty of jumps and was boatside in about ten minutes. This tarpon ate a white Exude jerk bait and was part of a large school feeding on glass minnows near the mangroves. The white Exude is my favorite artifical for fish like this. Despite all the typical Saturday boat traffic practically running us over at times, these tarpon kept rolling all morning and didn't stop until the temps hit 90 degrees. Tarpon season is in full swing down here on Pine Island and we're seeing them in all the usual places by the hundreds. In Matlacha Pass we're hooking smaller fish like the one pictured above which I landed last evening. It was a nice twenty pounder and put up a good ten minute fight on my 10-wt Sage Xi-2. The water was dead calmbut covered with grass when we started fishing for them an hour before sunset. The fish were rolling everywhere but working normal tarpon streamers was impossible since they'd immediately snag a hookful of weeds. I eventually tied on a weighted crab fly and cast to the closest roll, let it sink for two seconds, and twitched it once. That's all it took and the tarpon hit before the fly could get fouled with grass. This is the pattern I used, a modified Merkin that I call the Vieques Crab. Sunrise and sunset is the time to be on the water to spot the rolling pods of these smaller fish in the Pass. The middle of the day is insanely hot right now and that's the time to be poolside or sleeping in the AC which is what I prefer. We just got back from a week on Vieques, Puerto Rico and I'm happy to report that my pet school of bonefish are still alive and well on Encampment Beach. I caught this little four pounder on an unweighted Bunny Bone pattern and it was the first and only cast I made at them all week. I also managed to jump a baby tarpon in one of the local arroyos but didn't land him. It was great to see my house after a year up here in Southwest Florida and report that almost nothing has changed on Vieques. It's still the most beautiful and unspoiled island in all of the Caribbean. This is one of several snook that were hitting Puglisi baitfish patterns yesterday along the mangroves from Big Dead Creek up to Two Pines in the northern Pass. I didn't land any that would have been legal sized but the amount of these juveniles I'm seeing tells me that our population is just fine despite last winter's freeze. 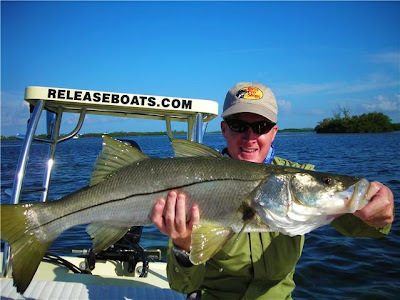 The state probably won't reopen the season in the fall and allow anglers to keep any snook but that will hopefully happen next year when the fish like the one in the photo hit the leagal limit. Until then you can still have a great time catch and release fishing for them with barbless flies like the green and white Puglisi I was using.